254 pages | 23 B/W Illus. Are humans fair by nature? Why do we often willingly trust strangers or cooperate with them even if those actions leave us vulnerable to exploitation? Does this natural inclination towards fairness or trust have implications in the market-place? Traditional economic theory would perhaps think not, perceiving human interaction as self-interested at heart. There is increasing evidence however that social norms and norm-driven behaviour such as a preference for fairness, generosity or trust have serious implications for economics. This book provides an easily accessible overview of economic experiments, specifically those that explore the role of fairness, generosity, trust and reciprocity in economic transactions. Resolving problems of coordination failure in organizations. The book discusses how norm-driven behaviour can often lead to significantly different outcomes than those predicted by economic theories and these findings should in turn cause us to re-think how we approach economic analysis and policy. Assuming no prior knowledge of economics and containing a variety of examples, this reader friendly volume will be perfect reading for people from a wide range of backgrounds including students and policy-makers. The book should appeal to economics undergraduates studying experimental economics, microeconomics or game theory as well as students in social psychology, organizational behaviour, management and other business related disciplines. "This is an excellent volume on experiments in economics, demonstrating that expectations for fair outcomes and trust are major driving forces behind economic behavior. Chaudhuri explains themes such as price discrimination, gift exchanges and public goods, neatly including their roles in economic behavior. The many clear examples make the book accessible to a wide audience. I expect this book to find a prominent place in many economic libraries." "Despite the great interest in experimental and behavioral economics over the past 20 years there is still a dearth of books that one can use to teach from and which can be used by laymen to learn what is going on in this rapidly changing field. Ananish Chaudhuri has written a wonderful book which is motivated by real world experiences yet closely tied to the state of the art research in experimental and behavioral problems. Dealing with problems of trust, fairness, social coordination, public goods and social dilemmas Chaudhuri takes the reader on a wonderful adventure from which he or she will certainly benefit. I highly recommend this book. "Chaudhuri has written an extremely readable introduction to experimental economics. This is perfect for advanced undergrads or graduate students who want to learn about state of the art research without being smothered by technical details." 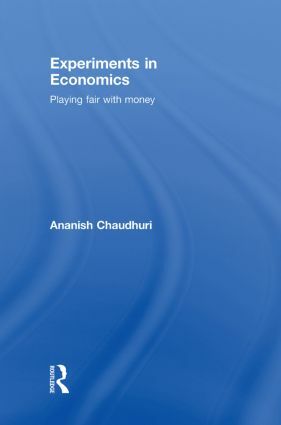 "With lucid prose and a wonderful set of examples, Ananish Chaudhuri brings important results in experimental economics to life, linking concepts such as trust, fairness and reciprocity to our everyday actions. At the same time, Experiments in Economics introduces the reader to the science, with engaging accounts of how economists use experiments to get answers to key questions in strategic decision making." "Are people fair-minded and helpful or selfish in the end? Why and whom do people trust? Why do people engage in community work? Why do people obey social norms and conventions? Not long ago these questions, which are at the heart of social life, were deemed outside the realm of economics. The advent of experimental economics and the interchange with the behavioural sciences has changed this picture entirely. Professor Chaudhuri is to be praised for having written a highly readable and informative account of one of the most exciting developments in the social sciences." "Ananish Chaudhuri has produced a masterful guide to the experimental literature on behavioural economics. Full of interesting real world examples, this exceptionally well-written book is accessible to non specialists. Yet, it nonetheless provides important insights into the scientific methodology of experimental economics, examining just how its practioners go about designing experiments to elucidate the roles that abstract concepts such as fairness, trust, and reciprocity play in explaining human interactions. Regardless of whether one is a behaviouralist, experimentalist, or "traditionalist," this is a must read." What this book is perfect for is giving interested readers who are not professional economists a flavor of what experimental economics does and why it is important. It is the book I gave my mother when she wanted to understand what I was always babbling about (she loved it!) and the book I use as the source of an additional reading for my intermediate microeconomics class when we play an ultimatum game in class. Economists who want a nontechnical treatment of experimental economics to give them a flavor of the field will find this book useful as well. Ananish Chaudhuri is an Associate Professor of Economics at the University of Auckland, New Zealand.